There’s more than love in the air this month at Jackpot Capital Casino. There’s also a lot of free cash flying around! 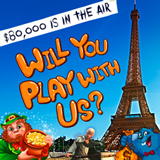 During its “Will You Play With Us?” casino bonus event, the casino will give away $80,000 in free casino bonuses. In this romantic Valentines month, many will ask “Will you marry me?” but at Jackpot Capital the question is "Will You Play With Us?" Why would we say "no" when playing casino games at Jackpot Capital automatically earns Scoreboard points that qualify frequent players for weekly bonuses up to $500 each!? Random draws give even occasional players a chance to win casino bonuses. Every week until March 12th, Jackpot Capital will give $15,000 in casino bonuses to frequent players, The 300 top point scorers will win up to $500 each every Monday. Then the scoreboard is re-set and another weekly race for top bonuses begins. You don't have to be a high roller to win though. Another $5000 will be randomly awarded every Friday -- so even if you just play occasionally you can still win some free cash. The randomly awarded Friday Bonus Boosts help players improve their scoreboard ranking over the weekend and qualify for bigger bonuses on Monday morning. Jackpot Capital Casino offers hundreds of games from Realtime Gaming. The newest is the Megaquarium tropical reef slot with its three stage bonus round. Along with all of the newest and most popular games, Megaquarium is available in the mobile casino (http://www.m.jackpotcapital.eu) for smartphones and tablets.